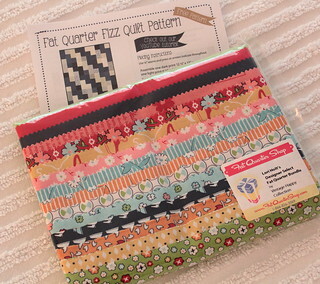 Yay it's Fat Quarter Fizz day here on the blog! The Fat Quarter Shop crew has a fun new pattern and I'm excited to be blogging about this cute quick quilt! I chose Lori's Designer Select Bundle for my project. In the blink of an eye my Fat Quarter Shop order was delivered! I added in 5 fat quarters Lori had given me at our lunch date and I had my 20 fat quarters! The pattern calls for 10 light and 10 dark fat quarters, so I broke my fabrics into two piles. I didn't have the high contrast light and dark that Kimberly has in the Fat Quarter Fizz video, so I snapped a phone picture of my light pile, so that I could keep track of my choices! Phone pictures look so good on my phone and so crummy here, so I made it tiny! You get the idea! Once you cut your pieces you've got a quilt in no time! I love Lori's cute collection Vintage Happy , so I took it to the vintage style Grove Park in Clayton when I was there recently and snapped some pictures of it. The sun was sure shining on a 105 degree day, but look how adorable this is! I just want to sit down with a lemonade an enjoy the sunshine. 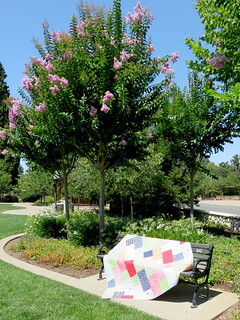 Fat Quarter Fizz is a fast and fun quilt to make, let Kimberly show you how in the Fat Quarter Fizz video! Be sure and hop right on over to the Jolly Jabber to see who else is blogging about this! So cute Pam! Amazing how our phones have become a quilting tool! 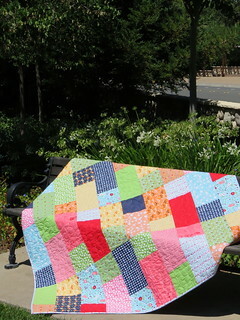 Your quilt is so bright and happy! I love it! And I live about 20 minutes from Clayton in Antioch! What a small world.